any kind of kickbacks, commissions or benefits. So just like other Product Battles I am going to look at several factors and determine which brand is the "winner" in said factor and why. However before I do that I am going to explain what these things are! Jamberry and Color Street are both Direct Sales Multilevel Marketing companies similar to Mary Kay, Avon, It Works or Pampered Chef. Both of them sell nail wrap products that help you to achieve adorable manicures and pedicures at home for a fraction of the cost of a salon look. Jamberry wins on this one, although that may change in 3 years. Jamberry has been around for seven years, while Color Street is brand new and has only been in business for a couple of months. Jamberry has TONS of designs, I was really impressed. I didn't count them all but I would say over a thousand different looks can be found. They also have a Disney Collection that is super cute, kid's sets, a line that has sports and college logos on them as well as a Design Studio where you can have your own custom wraps made! Color Street has a solid 40 designs to start with including geometric designs, some looks that are bold and bright, some that are sleek and simple, soft and romantic looks and more. In addition to nail art they also have french tip options, solid colors and glitter shades! I think they have a really solid start as far as designs and I can't wait to see them hone in on more chic looks in the future! I am sure they will collab in the future, they are a baby company after all, but Jamberry has them solidly beat here. Did I forget to mention Jamberry also has a Wonder Woman and Peanuts collection!? Because they do and it is AMAZING! If you know me then you know I care about ingredients very much! Jamberry and Color Street are both free of Parabens, Formaldehyde, DBP, Toluene, Formaldehyde Resin, Camphor, Ethyl Tosylamide, and Xylene! Woo! But Jamberry barely edged out Color Street by also being free of Triphenyl phosphate. However I will admit that of all the "toxic" ingredients often found in nail polish, this one is the least worrisome to me. It is used to improve flexibility as well as being a fire retardant. However in a study TPHP was linked to endocrine disruption, and although scientists insist that the amount in nail polish is not harmful, it is always good to be safe. You're probably like "but wait, you just said Color Street had that bad chemical in it, how did it win?" Because TPHP isn't actually bad for your nails at all. But what is bad? Filing or buffing the nail plate which is a part of applying Jamberry nail wraps. Also the strong adhesive on the Jamberry wraps is basically just strong glue that often causes damage when removing. Where the Color Street options are 100% Nail Polish and do not have any kind of glue-like adhesive and do not require you to file/buff the nail plate. Because of some controversy I am going to expound on this one a little. First of all with Jamberry if you pick or peel of your wraps (which is not recommended) you WILL damage the nail, there is no way around it. And if you do not push back the cuticle you WILL damage the cuticle. You also have to buff the nail plate to give the nail grip so the adhesive can hang on, (a lot of people file the nail plate because it makes the wraps last longer, but this is also not recommended). With Color Street while it is recommended that you push back the cuticle (because it will look nicer, and your mani will last longer) you will not damage your cuticle if you don't. You also don't have to buff the nail plate at all. And if you pick the wraps off you will see it is the same as picking off polish. You may nick your nail plate, but most often you are just fine. However with Jamberry wraps the removal process if long, which causes a lot of people to pick and peel their wraps. Color Street takes about 3 seconds to remove, so it's not as big of a problem. This is my personal opinion and experience. Durability has to go to Jamberry too. Their wraps pretty much stay on until you take them off. The Color Street ones last for up to 2 weeks, but will chip if you work with your hands a lot. Because Color Street is 100% nail polish, it behaves like a high quality chip resistant nail polish. However that is chip resistant, not chip proof. Jamberry pretty much stays put (at least in my experience) so it is the clear winner. The Color Street wraps are WAY faster to apply than Jamberry. I will break down the steps for each in the next comparison but Jamberry has 5 extra steps (6 if you count the one mentioned in comparison 8). The first time I did a Jamberry Manicure it took me just over 20 minutes to do one manicure. With Color Street in just under 20 minutes I did a Manicure and Pedicure! While it is true that if you practice and apply them often your Jam Wraps will become very fast to apply, the truth is the same with Color Street, and I personally feel like after years of practice you'd still be faster with Color Street, they are just SO EASY to apply. So I just made a chart below to show the step by step process of each product. It makes it clear why Color Street wins this one. EDIT - A LOT OF PEOPLE ARE ON MY CASE BECAUSE OF STEP #3 (FILE NAIL PLATE). I had been taught to do this, however you do not need to file the nail plate BUT you do need to buff it, which is not currently a step on the list and is not necessary for Color Street. I am noting the correction due to a lot of feedback, but I am not adjusting the list because it is a minor detail that doesn't effect the outcome of this post. 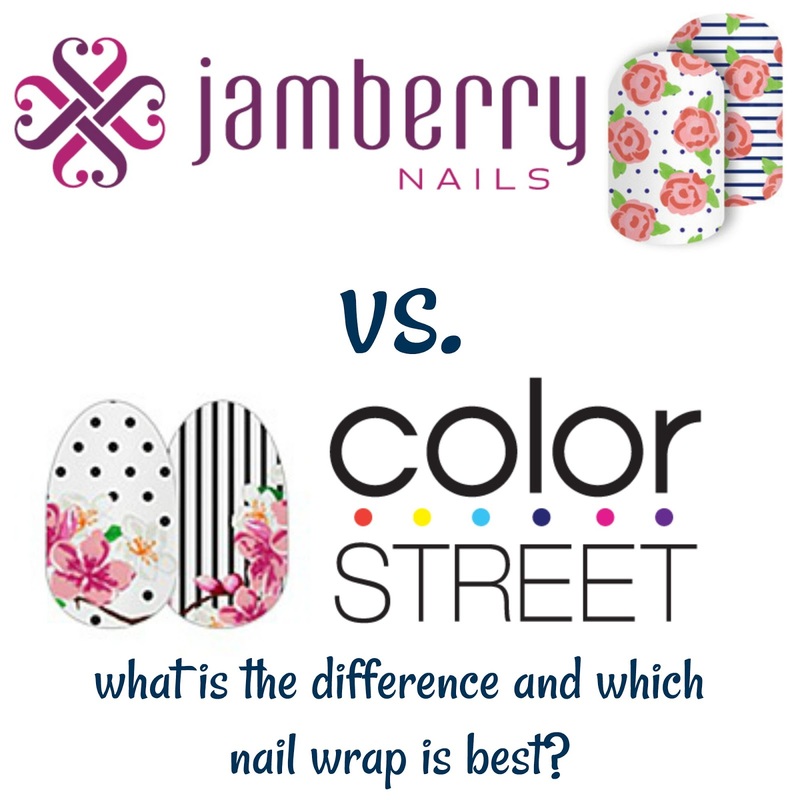 On top of Color Street needing 5 less steps than Jamberry, you can't touch the back of Jamberry nail wraps. The adhesive is to strong and it will become difficult to remove. This is not the case with Color Street. If you drop Jamberry on your table, hardwood floor or carpet it is a pain to scrape off, and that is not an issue with Color Street. I also want to point out why Push Back Cuticle is not a step for Color Street. While it is recommended because it makes for a cleaner nicer application, if you don't push back your cuticles your Color Street wrap will still work great! The Jamberry Nail wrap however will damage your cuticle a lot if you do not push it back properly and will often cause premature lifting, so it is a must for Jams and not for CS. This one was easy. Jamberry Nails have a lot of steps to remove. You have to warm them up again, use an orangewood stick to lift the edges, soak in polish remover, and go back and forth between lifting and soaking. If you do this wrong you could really end up harming your nail plate which is no good. Plus after you will have to work to remove the residue that is left behind. It took me 40 minutes to take of my Jamberry Mani! Color Street is real polish so you can just wipe it away with acetone or polish remover and a cotton round. Easy as pie. Color Street sets always include a mini nail file and two prep pads for you to use so you have everything you need right there in the set! Jamberry requires a heating device (use a blow dryer or their own heater that they sell for $20), as well as an orange wood stick, mini scissors, and a nail file. You can buy a fairly affordable set from them that I believe is around $60 and includes all this, a few other items and some wraps, it's a good deal. But you do have to gather all the items up which adds another step to your process, and not every wrap comes equipped with what you need for application. Last but not least, value. This was a close call but I gave it to Color Street (in all fairness I gave the last close call to Jamberry). The reason I chose Color Street has two parts. 1- I like that my nails look and feel like a REAL manicure. It's hard to say Jamberry does that because their wraps look and feel like plastic... because they basically are. Color Street is REAL nail polish, so it is a better replacement for a salon manicure. It's like replacing chocolate cake with mug cake, vs replacing it with a blueberry muffin. The muffin is good, it tastes nice, and is still a treat, but it's not much like the cake at all. The second reason I chose Color Street is I do feel you can get more Manis and Pedis out of it. Jamberry fans will say you can get more from their sets, but I disagree. I think you have to waste more with Jamberry and their wraps aren't stretchy at all either. The Color Street wraps are more flexible and I was able to get a little more out of them. In the end I like both brands, and encourage you try both for yourself. I think that the hustle of running your own MLM is hard, and one I respect. I have nothing but love for the men and women who work hard doing just that no matter what company they are with! Support local businesses guys, I bet you all have friends on Facebook who sell one of these! Great comparison on Color Street vs Jamberry, but early in your post you mention links you put on here are not to individual sites. You link goes directly to a Stylist site for Kelli France. Not sure if you realize that. Hi Lisa! Let me clarify. What I said was "I also have to put up a little disclaimer that I do not sell either of these products and none of the links I put on here will give me any kind of kickbacks, commissions or benefits." This is 100% true, I do not receive any kickbacks of benefits from these links. Because I am a big believer in people who hustle to make a better life for their family, and I want to support those who do this, I often link to my friend's MLM's on this blog. For example I talk about It Works stuff multiple times and I link to my friends sites usually (you will see Anna's, Suzanne's and even Helena's ItWorks pages linked throughout my blog). I linked to my friend Kelli's because she is a friend I want to support, as well as because she is my personal distributor and the person who introduced me to this awesome product! Since I published this, my friend Kelli contacted me to let me know that Color Street has a rule against linking your page on blogs and online forums, why I am not sure, that is not a rule I have ever seen in other MLMs (I mean I get not being allowed to pay for promotion, but if your customers want to talk about you I see no harm, you earned that mention!) so I removed her link and replaced it with the companies main site, and then added a recommendation that my followers find consultants and try to support local business owners by buying from them. I'm sorry but you do not have to file your nail plate with jamberry and in the offical application video it says you can buff which ous totally different. Also iud you put the jamberry wrap on your cuticle it will not damage it.. the wrap will just not adhere properly. With proper removal the jamberry wraps do not damage your nails. I had damage when I removed my wraps, and I did push my cuticle back. The damage was to the nail beds, and was mostly because I was impatient during removal and picked some off, regardless the removal is much harder and longer than Jamberry. With Color Street there is NO chance of damage at all. You can put it right on your cuticle and it will come off a little faster, but the rest of your mani will stay in tact. There is no peeling and adherent and no sticker involved, just 100% nail polish. 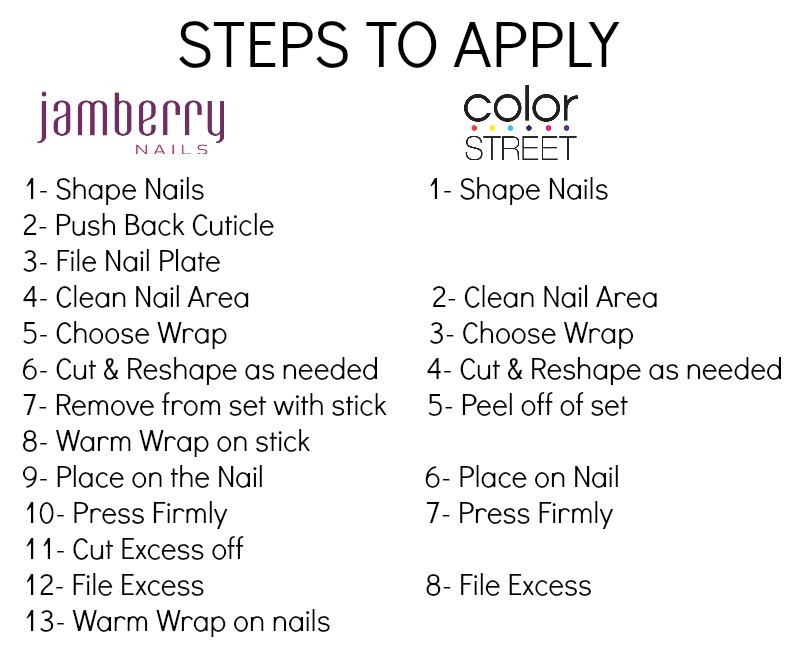 So while you wont get damage if you apply and remove Jamberry just right, there is no damage even possible with Color Street. Pixie - The thing that is great about Color Street is that even if I do not push back my cuticles I will have no damage, and that removal takes about 3 seconds. AND if I get impatient and pick or peel of my color street strips there will be no damage at all! Jamberry wraps have a high tendency to peel the surface layers of your nail plate and to cause damage to the cuticle and nail bed. I was a Jamberry consultant, and even with all the tips and tricks I knew, I ALWAYS had damage each time I removed. I tried heat, soaking in oil, soaking in remover, you name it, there was always some damage and it was always a pain. I am not a Color Street consultant, I have never tried them. But I did want to point out that some people's nail beds will adhere to the Jamberry wraps very strongly and they will cause damage. I've tried both and I Love Color Street A LOT better. So much easier to put on and take off and much better on the nails. Sadly...I removed Jamberry the way that they were supposed to be removed and they damaged my nails badly. It took an entire year for them to be normal. There has to be an underlying issue with your nails then because I've been using them nonstop for 4 years and I have never had damage. Polish based wraps will dry out once opened. and you still have to use nasty nail polish remover to remove. I've always used coconut oil and a floss stick to remove my wraps and they take 10 min tops. I dunno who taught y'all to remove and apply but they are way wrong. I understand you use different method, but I based my review on the way Jamberry as a company recommends you remove them. I can not base my review on others hacks, because that is not how the product is intended to be used. Yes, they do damage your nails. I used to sell them and tried everything to not have that happen because Jamberry told me they didn't damage. Lies! It made my nails so weak and constantly breaking. Goo Gone worked a whole lot better. That stuff removes ALL adhesive. I totally agree. I was putting on my Jamberry wraps recently and noticed on one nail that I had not done such a great job pushing back my cuticle. I figured it wasn't the main part of my cuticle so how much harm can it do? It did no harm to my cuticle but the wrap on that one nail lifted in a matter of a couple of days. But no harm was done to my nail or cuticle. I got the remainder of the glue residue off my nail with coconut oil - I don't use acetone to remove my wraps - washed my hands well and then properly pushed back that cuticle and applied a new wrap to it. No harm was done to my nail or my cuticle. The damage I had was on my nail plate, and was similar to what I see when I do gelish polish. Cutting and filing excess seem like the same step on Jamberry. I wear them all the time and get my manis done in less than 10 minutes. I never file or shape beforehand and I don't buff. If my cuticles are unsightly I will push them back but all I do before application is clean my nails. Remove the wrap, heat, apply and press firmly and file off excess. The removal hasn't ever been as complicated as you do it either. I soak my nails and they just slide off with no damage. I really think you had a dud of a consultant who gave you way too many steps and some really wrong information. I followed the video on the Jamberry website when removing my wraps. Also if you don't file the nail plate you do not dehydrate the nail and do all the steps, the damage is much less, the removal is much easier, and is ideal if you like to switch your wraps up often. I actually watched the official video on their website to get my steps. You have to use scissors to cut off the excess which leaves a sharp and jagged edge. Then you file it down to fit to your nail. I put them as to steps because they require different tools, and one is unnecessary with Color Street. But as you can see in my review it was a super close call. 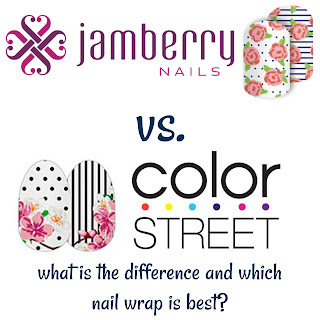 Color Street only got one more "win" than Jamberry. I honestly do not believe she had a dud of a consultant. I use to sell Jamberry and over their designs..still love all of their designs.. But the process of applying and removing is unreal and time consuming..most peoe do not have perfect nail beds that allow for hear and apply only so I consider you lucky. I do sell Color Street now and the difference is noticeable. Jamberry totally rocks at the moment though with all of the designs...excited to see Color Street in a couple years. That's great Judy! I got my steps off the Jamberry website, and I did expound on that step a little bit as well. Thanks for reading! I found any oil will remove jams. Accidentally discovered this when I had a faulty gloves and used old English. My mani had been on less than a week and they slid right off. For other hand, I didn't lift them or yank them off. I put old English on them too lol. Coconut oil or even olive oil will help release them. This is a great tip! I did choose to not only follow the recommended way on the website but to include that here, since I think the company recommended way is better. Thank you for your review it has helped me make an informed decision that is best for me, my nails, and my lifestyle! Glad I could help Jessica! I love this review, as it's unbiased and very informative. 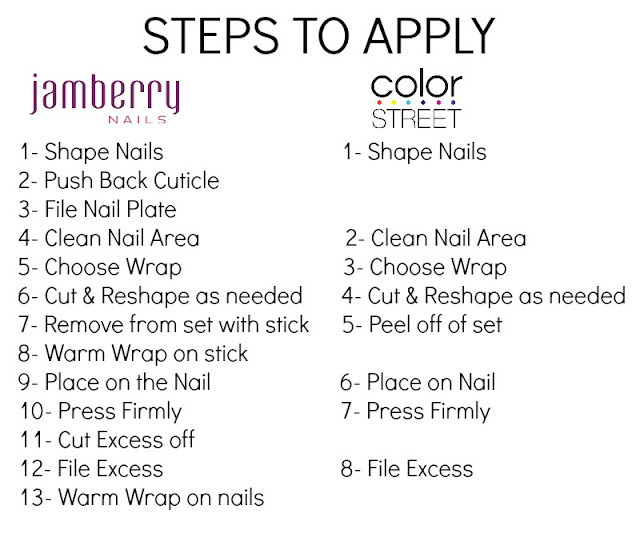 I recently signed up to be a stylist with Color Street and have had several people ask the difference between Color Street and Jamberry. Would you mind if I link them to this post? You are welcome to share this post as much as you'd like! IT IS IMPORTANT TO ME TO LET YOU ALL KNOW that the reason I am deleting comments is only if there are links or contact information for people to purchase Jamberry products or Color Street products. Also anyone who is being vulgar has had their comments deleted. I understand that this is similar to Jamberry, and these consultants may have been bummed to see a new similar product enter the market! However I am entitled to my opinion, and I personally really prefer the Color Street strips. This is not an end all be all list that shows everyone's opinions, just mine. It's one girl's take on a new beauty product. I am sorry if it upsets you that your favorite is not my favorite, but feel free to write your own blog post about why you love Jamberry! I was a Jamberry consultant, when they were new. I joined without having ever tried the product, because I loved the concept. I also loved the product but learned they don't work well for everyone. I have very curved nail beds, and always had wrinkles on some nails. (Picture trying to put wrapping paper on a baseball, without having folds. Can't do it.) I tried all the tricks, using different application methods, cutting little slits in the wrap, etc. They also adhered so strongly to my nail beds that no matter how I removed them, I got damage. So in the end, I decided to stop being a consultant, as I could not honestly tell people they were fast and easy to apply, and were damage free, as neither of these statements were true for me. And no, I am not a Color Street consultant, I only just heard of them today. Thank you for reading Belynn! I hope that you let me know if in the future there are other products you are interested in, or want to know about! Same. I was a jamberry consultant because i thought it was super fun and I needed an outlet from my normal life. But, I could never get the wraps to go on some of my nails without little bubbles, no matter how much I tried (hot method, cool method, plastic baggie method, etc.) and no matter how careful I was with removal, my nails had damage. I was told it was because I didn't put cuticle oil on my nails every day so my nails became dehydrated. Maybe. But, I felt like I lost "fire" for the product after about 6 months of continuous trying to do it better/right. Hello, Angela -- thanks very much for this post! I'm one of those people who never did well with Jamberry, no matter how many suggestions I tried from experienced users. I know some people who do get great results; that's why I tried them in the first place. I'd also tried another brand of nail wrap that didn't work well for me. After one last, super-frustrating try with Jamberry wraps a month ago, I searched online to see if there was any other nail wrap that had come onto the market since I last looked. That's when I came across your blog & read out about Color Street. I skeptically tried a small sample of their wraps (4 nails' worth), not expecting much. But I was amazed! They're so much easier & faster for me, they look great & so far are holding up well. I'd pretty much given up on finding a wrap that works for me & probably wouldn't have tried them without seeing your blog post. Thank you so much for your thorough, helpful review. I really appreciate bloggers like you who make the effort to write informative, fair commentary based on their personal experiences. I am so glad I was able to help you! Thank you for you feedback! I would have given durability to Color Street for sure. With Jamberry my wraps would start lifting at the edges within just a couple of days because of the hot showers I take. The heat from the water always loosened them, and so the only way to get a good week or so out of my Jamberry wraps was to take cooler showers (which I hate). Great review though! interesting perspective Laura! Thank you for commenting and reading! I tried and tried Jamberry. They never lasted more than a day or two before the tips lifted and got caught on things, Tehy lifted around the edges in about the same. I tried everything in terms or application. No luck. And my nails looked horrible after they were removed. I know they work better for some people but just not me. thank you for you perspective and feedback! Thank you so much for this review! I used to be a Jamberry consultant and I LOVED them! They lasted forever but ALWAYS damaged my nails when I removed them. The adhesive is very harsh. I haven't tried Color Street yet (that's why I researched comparison reviews) looks like I will give them a shot! I am hooked on Color Street, comment again once you've tried them and let me know if you are in love too! I just tried Color Street 2 weeks ago and I am in LOVE! So easy to apply, and if you add a clear, anti-chip top coat nail polish on top of that, they will last forever. To remove, all I did was use a 100% acetone dip remover/tub. Easy peasy! I love the idea of a dip tub! Thanks for commenting! I have to agree. I've used both and like Color Street better for ease of use, the look, and ease of removal. I just wish they had more designs but I'm sure in a couple/three years their designs will be plenty. Thanks for this review! That's it. You COULD trim them down before filing if you want, and add a few seconds per nail with the trimming. The only Jamberry wraps I have had trouble with are the glittery sparkle ones. I have a few pics on my Instagram of Day 1 application compared to later on if you'd like a link! They seriously last way better using her method than what I got the first time by myself. By day 10-14, they peel off easily with no damage at all to my nails. I use a mix of Jamberry and OPI or Sally Hansen Miracle Gel with either SH Miracle Gel topcoat or Seche Vite fast-drying top coat. Thank you for the comparison. I am a Jamberry user and discovered a friend now sells Colorstreet. Your blog convinced me to request a sample. Just curious...I have used Jam berry a few times, and once they are on, wherever they don't perfectly stick, I feel like they will lift and come off. The ultimate test is running all ten fingers through your hair and I couldn't do that with Jam berry. Is it the same with Color Street? Will I be able to run my fingers freely through my hair? haha sounds so funny but I don't like babying my nails! I agree that would happen with Jamberry often for me. With Color street the strips are MUCH thinner than Jamberry and so it is way easier to lay them flat. I also like to put a clear coat of polish over the to seal them in a little better. If I don't get them laid down flat they will catch on thigns and pull. But Jamberry is thick and you have to peel them off when your done. These actually chip and flake like regular nail polish and come off with acetone, so I rarely have an issue with them. It's only if the strip wasn't small enough for my nail bed and I am to lazy to cut it to shape that this is ever an issue. But I did a full mani set on the train this monring in 10 minutes! No nasty polish scent to bother the others and I they were just so easy! I based my review by using the companies recommendations and steps on their website. I can't base it on tricks from others, when that's not how the product is intended to be used. I love Jamberry! Also I am trying color street for the first time. So far I am loving color street too! And yes everyone is entitled to their opinion and they should express it. I just don't like that it seems unfair to say that jamberry damages nails when you are not supposed to file the nail plates or to peel them off. Also buffing the nails is not required and I never do when I apply. They have always lasted me a long time. And I have peeled them off sometimes. I do it slowly and haven't damaged my nails. And peeling regular nail polish is bad for your nails too. Yes it won't be nearly as bad but it can. Yes color street takes less time and is easier to remove. But if you don't want to take the time to put on or remove wraps that is not the products fault. Yes jamberry is not for everyone and color street may not be for everyone. Jamberry may not have worked for you but this reads as if your opinions are facts doesn't seem right. I have never had damage from jamberry. Everyone nails are different and if jams do damage your nails of course don't use them. Color street is a great product too and a great options if jamberry doesn't work for you. I personally will use both products because they are both great and I love all nail art. Just my opinon. I have used both and I Love Color Street more due to the fact it is so much easier and faster to put on and remove. I was able to use one box for both my nails and feet! I love the designs so far and hope they start getting bigger in the coming years. I am not a consultant, I just tried jamberry from a friend on FB who switched to Color Street. Everyone had their opinion though. There is nothing wrong with Jamberry, it's just with an 8 year old, 7 year old, and 4 month old, getting this stuff on fast and taking it off fast while still having lovely nails is a Blessing in my bust life lol. I will say this, if you haven't tried Color Street, try it! I find the Color Street product much less abusive to my nails. I have lupus which makes my nails split and peel all the time so Jam Berry were very harsh and as much as I love the designs have to limit use or I destroy my nail beds. Color street actually protects my nails so they can grow out without splitting and removes with just plain polish remover!! However since I keep my nails short I thought I could save by getting two nails covered with each single wrap. I was disappointed when I went to use the second sheet a few weeks later and it was dried out and brittle. So my question is this, do you have to use the Color Street policies once opened or is there some way to use the ones you need and save the unused ones for later dates??? The trick I was shown to keep them from drying out is when you finish your nails, put the remaining sheets back in the plastic sleeve they were in(pushing it flat to keep out as much air as possible) and use your hair straightener (set on a low heat) to reseal the end. Hope that helps! I don't have a hair straighter. I use my regular iron to seal the leftover strips in their plastic sleeve. It only takes a minute or two, and you get a really great seal. I love Color Street nail wraps! Hi Angela! Loved this post! Just wanted to say that Jamberry released a new product called Skinnies (I think since you first published this post) which are more closely related to Color Street in that they don’t require a heater- just peel, stick, and go. A friend of mine recently switched from Jam to CS so as a Jam consultant I got curious which is how I found this post to begin with. Anyway, Skinnies are $11 for a sheet of 18 wraps in varying sizes, and are advertised to last for a weekend, although some people say they last longer. I am curious if Skinnies are an attempt to be more competitive with CS. Perhaps you could try them and update/do a separate post? Thanks for writing this! Very informative! I am always open to try them, if you'd like to send me some I an happy to link your consultant site in my post about them! I am waiting for them to come out with the official sample sheets but if they don’t do it soon I may just send you a full sheet. I’ll keep you posted! I am about to put my first set of Jamberry wraps on and I use a ton of coconut oil normally. Will this be a problem for me and make the wraps lift off?? It helps if you lightly buff your nails and then wipe them with rubbing alcohol before applying. Once the wraps are on though, they shouldn’t lift unless the coconut oil gets under an edge or something. Jamberry has launched Skinnies which requires no heat. They are weekend wear type of wraps. Also Jamberry is thinking smart and has branched into offering beauty (hair, lip lacquer and brows) and hand/foot care. Color Street offers a simple nail polish wrap. I think hands down Jamberry has the strategic marketing scheme. And that it then apply my wraps and what ever and done!! Always have and mine always last a lot longer!!! Thank you for the comparison! I must say that it is unfair of someone to assume that "something must be wrong with your nails then" because you had damage taking off jamberry. People's nails respond different to a variety of products, and I felt this comment was unnecessary and clearly bitter. Just thought I'd share my two cents there. Overall, great comparison. Thank you for writing up! Really nice article! I do disagree about value though. I can get 2-3 manicures plus accent nails with Jamberry. Color street is 1 manicure and you have to hope they don't dry out if you want to use the rest. Best bet I've had so far with color street is to do a mani and pedi at the same time. Jamberry application requires heat, but they take around the same amount of time to apply for me. Overall I love both, but I think I'm more of a Jamberry fan. Thanks for the review! I have a terrible time with jamberry and wanted a comparison to color street. This really helped! great review! I have a lot of experience with both & completely agree with you! I am a former jamberry consultant, loved the product but they took a long time and I had to set up the heater, etc. & got a lot of customer complaints of nail damage, I now sell Color Street & the difference is amazing! I LOVE color street for the ease of application & removal hands down, jamberry is a great product too just very time consuming and you have to be careful when removing or when working with oils etc. Plus color street are more affordable, which i love. I like your comparisons and think you did a fabulous job. Thank you for taking the time to put all of this together . I am considering selling color street and you provided me with some very beneficial information and insight. Thank you! Great review of the 2 products! I never used Jamberry because of the time it took to apply although they did have cute designs. I tried Color Street about a year ago and was truly skeptical. After 2 weeks, I was hooked. Mine last up to 2 weeks. I loved the Color Street product so much I signed on as a stylist. The company has come a long way since this blog post was written and I think you will see new products that are much more stylish but still the same value. Thanks for sharing your thoughts Angela! Thanks for your review. I tried Jamberry and their product wouldn't stay on my nails. After they replaced the set twice (and insisted on watching me apply to make sure I wasn't mucking it up) they determined that my nails produced too much oil for their product lol. I have a friend pubbing Color Street and am hoping for better success since I can wear nail polish (although for shorter intervals than the average person usually). Your review helped me to make up my mind to give it a try, so thanks! SO Jamberry has a new product called Lacquer Strips which seem to be very similar to Color Street's. I'd love if you would do a side by side comparison of those since they are similar products now.